For more than a decade, financial services firm Regiments has managed billions on behalf of the City of Johannesburg. It is one of the City’s most lucrative but controversial contracts. New evidence shows that Regiments paid a top ANC leader millions to smooth its way. Geoff Makhubo – chair of the ANC’s powerful Johannesburg region and prospective mayoral candidate – scored an estimated R30m from the City of Johannesburg by acting as an influence broker, new evidence suggests. In 2006, Regiments Fund Managers, a division of Regiments Capital, received a contract to manage the city’s "sinking fund", a pool of several billion rand put aside to meet the city’s future debt repayments. By 2015, Regiments had taken an estimated R300m in fees. Emails and documents obtained by amaBhungane reveal for the first time publicly that Regiments agreed to pay 10% of those fees to Makhubo’s company, Molelwane Consulting. Makhubo denies acting as an "influence broker" and says the deal was above-board. While their contract stipulated that Molelwane would provide some initial financial analysis, significantly it also required Molelwane to "maintain… strategic relationships with CoJ". The 2006 Regiments sinking fund contract with the city endured for almost 10 years – as did Molewane’s 10% cut, as far as could be established. At the time the 10% contract was signed Makhubo did not hold an official position in the ANC or in the city, though he was said to be an ally of Parks Tau, then the member of the mayoral committee (MMC) for finance. The Regiments contract fell under Tau’s portfolio. But as Makhubo’s political star rose, he increased his potential to open doors and smooth political roadblocks. In 2008, Makhubo was elected as treasurer of the ANC’s Johannesburg region. Then, in 2011, after Tau became mayor, he took over as MMC for finance, placing the Regiments sinking fund contract directly within his sphere of responsibility. Tau admitted in a written response that he knew Makhubo was linked to Regiments when he appointed him as MMC, but maintained Makhubo had done the right thing to remove the conflict of interest. "I was aware that Regiments and Molelwane had a business relationship. However, I was not privy to their internal business arrangements or transactions," he told us. He added: "On [Makhubo's] appointment he committed [to unwind] and begun winding down his business interests, which ensured that he was not 'the player' and 'a referee' on the said contract, or any other contracts in the City." But Makhubo did not "unwind" his interest in Molelwane. Records from the company registrar still list him as an active member of Molelwane. And despite providing eight pages of written responses, Makhubo could neither explain this nor why he continued to declare that he held a 67% stake in Molelwane in the City’s public register of councillor's interests. "Our records reflect that Mr Makhubo continued to declare his majority shareholding in Molelwane Consulting CC until 2017/18," the City confirmed in a written response. Makhubo said he could not disclose how much Regiments paid Molelwane. He told us: "Unfortunately I haven't had the opportunity to do a reconciliation of the actual total earnings…"
But evidence suggests that Molelwane continued to be paid after Makhubo was appointed as MMC. Regiments' internal budgets show, for example, that R4.9m was earmarked for Molelwane in fiscal 2013 and another R5.5m the following year. This means that as the City's official tasked with policing one of its most lucrative and controversial contracts, Makhubo was benefitting from that same contract in exchange for "maintain[ing] … strategic relationships" with the City. "I can emphatically state that all my dealings and the operations of [Molelwane] have been ethical and in accordance with strict corporate governance…. This is no different as an office bearer of the ANC and during my tenure as the MMC of Finance in the City of Johannesburg," Makhubo told us. On Thursday last week, the council passed a motion that would allow the city to take back control of the sinking fund before Regiments’ second contract expires in September 2020. The City has launched a forensic investigation into both the sinking fund contracts as well as numerous other contracts the City awarded when it was under ANC control. 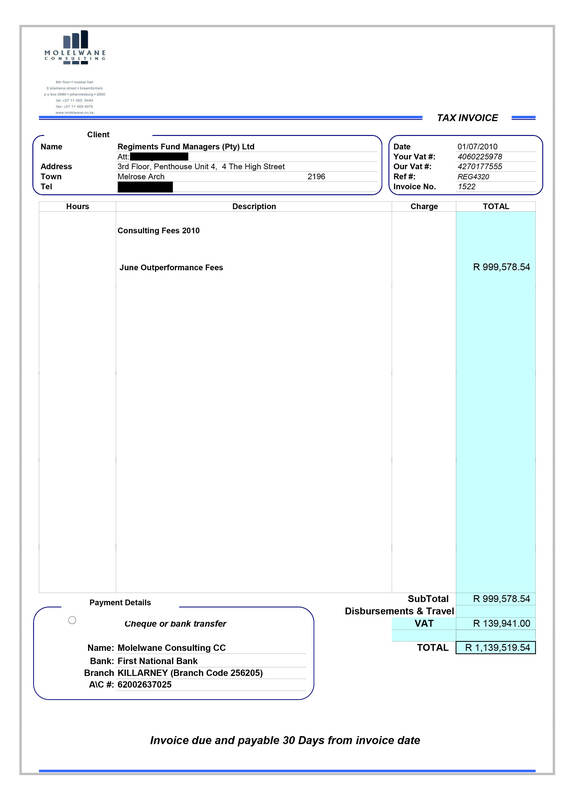 Although Regiments’ ongoing payments to Molelwane after Makhubo became MMC may be construed as "kickbacks" and potentially contravene anti-corruption legislation, we have no direct evidence that the payments started out as common-or-garden-variety bribes to secure the 2006 sinking fund contract or its renewed award to Regiments in 2015. Regiments ignored all requests for comment. "Your conclusion on the relationship between the ANC, City of Johannesburg and Regiments is unfortunate," Tau told us. “We are a bit low on cashflow…” Makhubo told Regiments’ director Eric Wood via email. It was Monday August 30, 2010, and Makhubo was desperately looking for money to plug "month-end commitments" just two days away. "I will appreciate if the transfer can be done today," he continued, attaching an invoice for R1.14m for "consulting fees" to be paid to Molelwane, which on the face of it specialised in accounting, tax consulting, advisory and financial services. Makhubo’s mother held a one-third stake in the firm alongside his two thirds. Makhubo’s request to Wood was not a once-off request: a second document attached to Makhubo’s email showed that Molelwane had received R3.95-million from Regiments in the preceding nine months. At the time – August 2010 – Makhubo had not yet been appointed MMC for finance, but as treasurer of the ANC’s Johannesburg region he had political influence over a key source of patronage: the City of Johannesburg metropolitan municipality. "I will send on a separate email a letter from the ANC discussed with [Regiments’ chairperson Litha Nyhonyha] on the donation of R200,000 to R250,000 that was needed urgently into the ANC account," Makhubo’s email concluded. By 10.30 the next morning, Regiments had paid R600 000 into Molelwane’s account with the promise that the rest of the R1.14m would be paid "by the end of the day or latest tomorrow". To understand why Regiments would jump at Molelwane’s request for money in 2010, one needs to go back to 2005, when the City of Johannesburg first decided to establish a sinking fund. When we first asked about the secretive deal between Regiments and Molelwane, Makhubo tried to downplay it, telling us in a written statement that Regiments and Molelwane had agreed to "explore business opportunities on mutual areas of interest" and that Molelwane had merely agreed "to provide advisory services within its areas of expertise". But the actual wording of the contract, signed by Makhubo for Molelwane and Nyhonyha for Regiments in January 2006, suggests otherwise. Under "fee structure", for instance, there was only one deal on the table: Regiments’ freshly inked sinking fund deal. Molelwane was promised 10% of Regiments’ fixed fee, 10% of Regiments’ outperformance bonus, and almost half of Regiments’ R850 000 upfront "structuring fee". In exchange for this windfall, Molelwane effectively agreed to act as a lobbyist. Under “responsibilities”, one of Molelwane’s tasks was to "[m]aintain on an ongoing basis all strategic relationships with COJ before, during and after completion of fund management mandate for the mutual benefit of the parties". Makhubo refused to identify which "strategic relationships" he would be required to "maintain", but in a second written response told us: "The clauses of the contract were very clear, commercial and had no other meaning as suggested. Any suggestion … of impropriety or corruption in the relationship between Molelwane and Regiments is without basis." "There are no merits to suggest that a risk based remuneration agreement would be solely based in 'exchange for maintaining strategic relations'. That’s a very narrow and simplistic way of looking at it… [I]t naturally becomes the responsibility of all parties to the agreement, without exception, to build and maintain relations with the client. There’s absolutely nothing peculiar with that." What is peculiar is that, despite Molelwane taking very large fees, both the City and Umbono Fund Managers, which partnered Regiments on the contract, told us they had no record of Molelwane’s involvement. The evidence shows that Regiments was buying something more than vague financial analysis that it could do itself. By late 2010, with Makhubo installed as ANC treasurer, it was clear what Regiments believed it had bought. 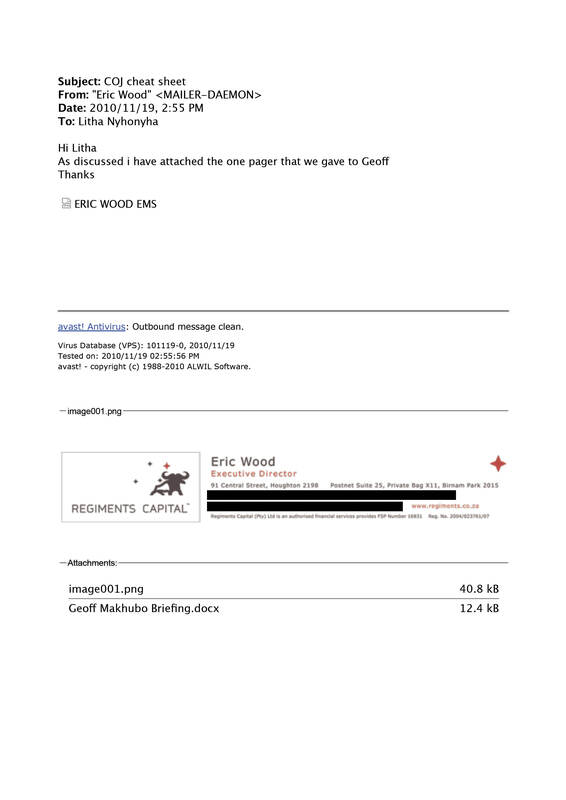 "As discussed I have attached the one pager that we gave to Geoff," Wood told Nyhonyha, his chair at Regiments, in a November 19, 2010 email with the subject line "CoJ cheat sheet". In case there was any doubt about which "Geoff" he was referring to, the attachment was saved as "Geoff Makhubo Briefing.docx" and it contained an extraordinary shopping list of what Regiments seemingly expected Makhubo – now a member of the Johannesburg ANC’s executive – to deliver. There was a R1bn loan that Regiments was trying to sell to the City: "Stalled because Parks [Tau] made some negative comment re the pricing … Direction needs to be provided to Treasury to proceed with this loan," Wood directed. Treasury is the department that falls under the finance MMC, which Tau was at the time. There was also an interest rate hedge that Regiments stood to profit from: "Treasury has approved the transaction in principle, needs mandate from Mayoral Committee". And a Johannesburg Property Company tender: "Needs to be adjudicated and appointment needs to be made". And R27m in Regiments fees that the treasury was sitting on: "The withholding of these funds is unlawful and needs to be released forthwith," Wood ordered. But Wood's most telling instruction related to the renewal of Regiments’ sinking fund contract, which was due to expire in January 2011 and was back up for tender. "Needs to be adjudicated and appointment needs to be made. The issue around splitting the mandate between two [fund] managers needs to be killed," the cheat sheet read. How, we asked Makhubo, was Regiments so confident of winning the tender that it wanted to "kill" any suggestion that the contract be split between two fund managers? His response to this and other questions about the cheat sheet was evasive: "I have never been involved in procurement processes therefore I wouldn’t know how a bidding party would derive a sense or feeling of surety." When pushed he told us: "I have no recollection of the so-called 'cheat sheet' and the issues raised have nothing to do with neither Molelwane nor our agreement with Regiments Capital." By law, there is meant to be a Chinese wall between political office bearers and the procurement departments of the municipalities they control. Even Tau, as the then-MMC for finance, could not legally interfere with the city’s tender processes. Yet over the next year, Regiments received almost everything on its wish-list: In January 2011, the city agreed to release R18.4m of Regiments’ fees; in March, Regiments facilitated a smaller R250m loan for the City and received R1.25m as a raising fee; and in December, Regiments was one of two bidders awarded Johannesburg Property Company tender. The only hiccup was the tender for the new sinking fund contract. Under Regiments the fund had performed well, but a review conducted by KPMG in 2010 criticised Regiments’ fees for being excessive. When the bids for the new tender to replace Regiments’ first contract were adjudicated, "Regiments Fund Managers … was not a preferred bidder and had in fact been disqualified", Isaac Mogashoa, the City’s group head: legal and contracts, told us. But just as the goose laying the golden eggs appeared to be running out of luck, Tau discovered a fundamental flaw with the tender process. "The MMC Finance's view … is that the evaluation process must include social investments to uplift the communities around the City," Khomotso Letsatsi, the head of treasury, told colleagues in an April 2011 memo. The award of the new sinking fund contract was already months overdue, but according to Letsatsi’s memo, Tau halted the tender on the grounds that it did not include a programme to address transformation in the city’s procurement practices. Tau denies he intervened to protect Regiments’ interests: "The articulated principles of transformation requirements in the memos applied to every tender in the city and not just the Sinking Fund tender." Instead he pointed us to a letter, written by Gauteng’s then-MEC for co-operative governance, Humphrey Mmemezi, in March 2011. "The primary reason for the cancellation of the sinking fund tender was as a result of an issued instruction by [Mmemezi] at the time to defer all local government tenders until after the 2011 elections," Tau explained. Although Mmemezi had already walked back on his instruction in a follow-up letter in April 2011, emphasising that municipalities should continue with their normal business, the second sinking fund tender was put on hold. It would take a year for the city to re-issue the tender. In the interim, Regiments’ original contract was extended and kept running, and seemingly so did Molelwane’s fees. So did Regiments just get lucky? Or was it a case of the more they invested, the luckier they got? By 2011, the evidence suggests Regiments had already "invested" quite heavily in and around both Tau and Makhubo – quite apart from Molelwane’s 10%. In 2007, Regiments jointly-led a BEE consortium that bought a stake in Capitec, then an upstart in the banking industry. The Coral Lagoon consortium was stacked with ANC funders and those with links to the party, but the deal also included a small but lucrative stake for Tau’s wife, Philisiwe Twala-Tau. At the time, her shares were worth R3m but today, those shares are worth roughly R50m. An identical stake was also allocated to Makhubo’s wife, Dikeledi Majola. Regiments has previously maintained that it did not hand-pick consortium members. However, a year later it happened again. In September 2008, Regiments put together a BEE consortium to acquire a 4.24% stake in JSE-listed Vox Telecom. Regiments’ own documents show that under several layers of the corporate onion was a small group of "strategic partners" who would each receive shares worth just over R1m. Included in the group was Makhubo, who had been elected treasurer of the ANC’s Greater Johannesburg region just one month before at a conference partly funded by another R250 000 donation from Regiments. Emails show that Tau was also listed as one of the "strategic partners" but withdrew from the consortium at the last minute. Unlike the Capitec deal, the Vox deal quickly unraveled. On the day it was signed the share price collapsed. The "strategic partners" walked away unscathed. By 24 May 2011, the local government election results were in. The ANC had kept its majority in the City of Johannesburg and appointed Tau as the new mayor. With Tau moving up, Makhubo was tapped to take his place as MMC for finance. Makhubo denies the Molelwane contract made him conflicted. "There was never a conflict of interest as the term of Molelwane agreement with Regiments on the first Sinking Fund would have lapsed in January 2011 the year I took public office," he said. "I … made a commitment to the Mayor of the day and the ANC when I was appointed MMC that I will unwind my interests and resign all my directorships. All this was done in November 2011… to deal with real or potential conflict of interest." But it is only half true that Molelwane’s contract "would have lapsed in January 2011". When the second tender was cancelled, Regiments’ original contract kept running, and running. In fact, the city confirmed that Regiments’ first contract was ultimately extended until September 2015. Records show that the payments to Molelwane only increased in this period. For example, Regiments’ budget for the year ending Februarty 28, 2014, predicted that Molelwane would net R5.2m for the year. Yet, a Regiments actual income statement shows that by September 2013, with another five months to go, Molelwane had already received R6.9m. 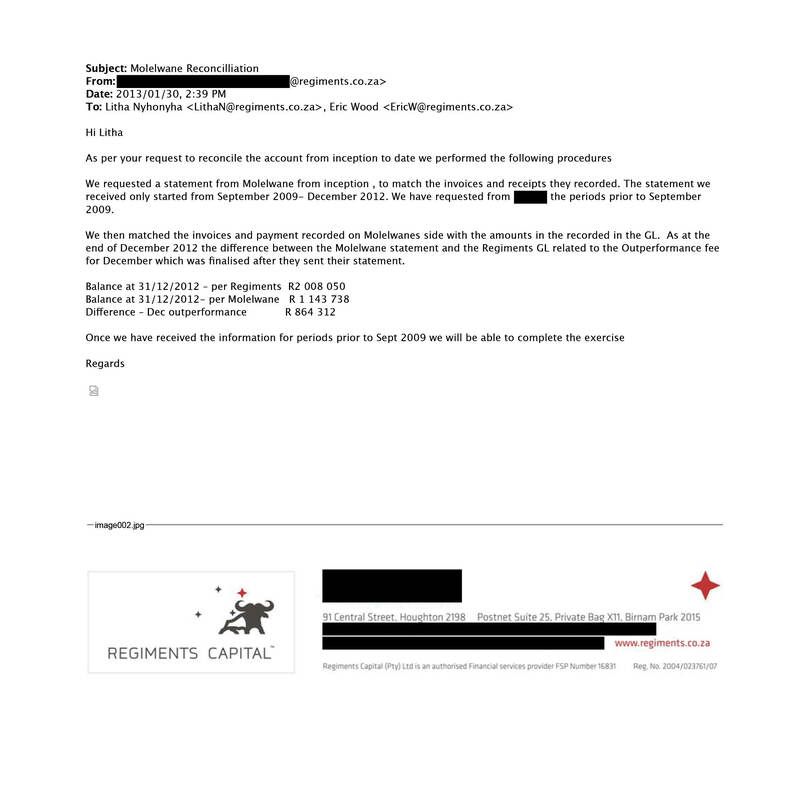 Over the past month, we repeatedly asked Makhubo to confirm when Molelwane stopped receiving payments from Regiments. Each time he dodged the question. Makhubo also did not offer any explanation for why his “resignation” was never officially registered or why he continued to declare his stake in Molelwane for the seven years after he supposedly resigned. Last week, ANC spokesperson Jolidee Matongo sent us a resolution signed by Makhubo purporting to show that he resigned from Molelwane in November 2011. But the records are ambiguous. The resolution had Makhubo resigning as a "director" – not shareholder – meaning that he would have remained entitled to his two thirds of Molelwane's profits. But complicating matters further, Molelwane was a close corporation, a form of company which does not have “directors”, only members. Despite our request for clarity, Makhubo refused to own a version. Instead, in a final written response told us: "I would like to reiterate that I have replied to the questions and provided requisite clarity." Even if we were to accept Makhubo’s claim that he resigned, this would have left his 64-year-old mother as the sole beneficiary of the company and Regiments’ largesse. In April 2012, the city issued a new tender for the sinking fund contract. This time Regiments not only made the shortlist, it was the only company to do so. The 12 bidders included four major banks – Standard Bank, Nedbank, Investec and Rand Merchant Bank – as well as several large asset managers – Momentum, Sanlam, Stanlib and Old Mutual. Most were eliminated on technicalities and those that made it through were marked down for lacking a track record in managing sinking funds. Only Regiments – whose fees were the highest out of eight bids analysed in the bid evaluation committee’s report – was left standing. In August 2012, rival bidder Colourfields approached the Johannesburg High Court to try to stop the city from awarding the second sinking fund contract to Regiments. When amaBhungane published a series of articles in October 2012, pointing to signs of manipulation in Regiments’ favour, Tau called for an investigation. "When this matter was first raised with me by Amabhungane … I had immediately referred it to the Integrity Commissioner in the City of Johannesburg and the Public Protector to investigate," Tau told us in his written response. At the time, almost no one knew about Molelwane’s "10% deal" with Regiments, so the investigation by Advocate Jules Browde appears to have largely focused on whether the Capitec shares given to Tau’s wife were intended as a quid pro quo for Regiments securing the first deal in 2006. Browde’s report concluded that "Tau played no part whatsoever in the tender process or the subsequent contract entered into between the City and Regiments" and dismissed the allegations, saying that the award of the sinking fund contract "appears to have been above board". According to Tau, a subsequent review by Deloitte also gave the second sinking fund contract a clean bill of health. In 2015, after Colourfields aborted its legal challenge, the contract was finally re-awarded to Regiments for another five years. So why, three years later, is the City once again prising open these contracts? As the manager of a sinking fund, you have one job to do: make sure the money is available to repay debts when they become due. According to the City, state armaments company Denel’s failure to repay the fund a R290m loan made under Regiments’ stewardship triggered a forensic investigation into Regiments’ management of the fund. "During 2018, the R290m Denel loan from the sinking fund had to be repaid but Denel did not have the funds and Regiments failed to inform the City timeously," Mogashoa said. Unbeknown to the City, it appears that Regiments was eating at both ends of the deal: While Regiments Fund Managers was being paid to make prudent investments on behalf of the sinking fund, Regiments Capital received a R3.42m fee from Denel, seemingly for securing R290m in debt from the sinking fund. The City has agreed, Mogashoa said, to wait until December 10, 2018 for its R290m, but the "distrust and concern" that the incident generated, coupled with the growing evidence that Regiments had helped facilitate Gupta-led state capture, led it to launch the forensic investigation into the sinking fund contracts and "all transactions processed through the Sinking Fund bank accounts from 2006 to date". Up until today, the city does not know how much Regiments has received from the two sinking fund contracts, but estimates it to be in the region of R400m. But if the City seeks to reclaim any portion of the sinking fund fees it will have to get in line. Regiments is already in court with a Transnet pension fund which wants Regiments to return R228m in fees, and last month Transnet itself filed papers demanding that R151m in excessive fees be repaid. In the pension fund case, Regiments faces more than just a financial threat though. In August, the Johannesburg High Court granted an "Anton Piller" order that resulted in Regiments’ email servers, laptops, hard-drives and cellphones being seized by the sheriff of the court. The court granted the order in secret based on claims that these digital records hold crucial evidence relating to the pension fund case. But the hard-drives are also likely to hold something far more damaging: evidence that Makhubo was just one target in a much wider bid by Regiments to own the ANC. For more on Regiments’ capture of the ANC, read the next part of this investigation … coming soon. The amaBhungane Centre for Investigative Journalism, an independent non-profit, produced this story. Like it? Be an amaB supporter to help it do more.